After the success of We're the Millers, a comedy that got mixed reactions from critics, yet that I personally really enjoyed, Rawson Marshall Thurber is back to make audiences laugh once again with his newest comedy, Central Intelligence. In this film, Calvin Joyner (Kevin Hart) meets, through Facebook, an old high school classmate, Bob Stone (Dwayne Johnson). After what appears to be an innocent night of drinks between buddies, Calvin is lured into an espionage plot by Stone who doesn't accept 'no' as an answer for Calvin's involvement. 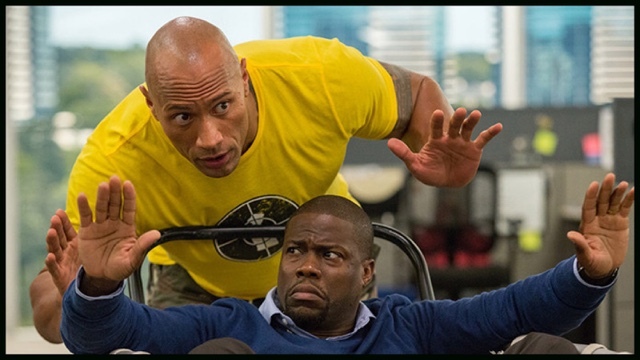 Despite not being particularly excited for this comedy, I was curious enough to check out what The Rock and Kevin Hart could have in store for a good buddy action comedy and the results are kind of underwhelming, even though nobody comes out of this looking bad. The film opened with a very offbeat flashback scene that could not find its voice and ended up being mean spirited. It turns you off immediately because other than being uncomfortable it also is not funny. Fortunately, as soon as Kevin Hart appears on screen as his present-day self a lot of that goes away because had it kept going in that direction it could have become one of the most annoying and ridiculous films of recent years. I cannot say I laughed a lot in this film, the laugh out loud count was most probably under six, yet in its defense I can confidently say that throughout the whole duration I did have a smile on face.l That is indicative of the measure of the film. It is not by any means a great comedy, there isn't a smart use of cinematic technique to deliver laughs, it is shot way too generically to give it any kind of interesting or upbeat stamp to it. Not to mention how utterly overbearing this predictable plot is, which isn't half as smart as the writers think and doesn't become a parody on itself or the genre. It doesn't give the film a funny self consciousness, but instead just falls flat, unfortunately, and fails to matter in the bigger picture. What the movie does have is two great, charismatic, funny leads, with good chemistry that play off each other perfectly when there isn't generic writing or directing getting in their way. Many times you don't get to enjoy Hart or Johnson because of standard sub-witty banter or observational comedy that we have seen too many times in American comedies and is a trend that has to end because it clearly isn't funny. Yet, when the two leads manage to play a scene fully or riff off each other it is a joy to see and Hart does a good job of playing the straight man and letting Johnson unfold on screen, which gives us some great moments and some very good running gags that were some of the most funny parts of the film. Moreover, an element that is nailed in the film is giving each secondary and even tertiary characters a specific vibe which results in some great laughs and henchmen not being anonymous people appearing on screen, and instead contributing to the picture. Whilst the ending of the film was a disaster that made my score and overall enjoyment of the film decline, I still had a decent time with Central Intelligence. It isn't a fresh comedy by any means but it did have some inspired moments.